I’ve said it before and I’ll say it again: I LOVE SOUP! This week’s recipe for French Fridays with Dorie was so simple to prepare. The hardest part was finding the right kind of squash: a red kuri squash. 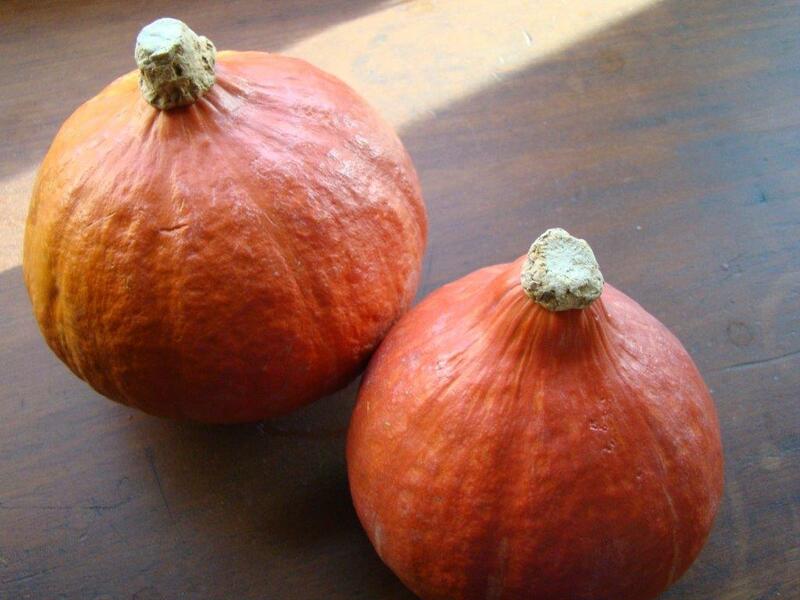 Red kuri squash are not in the typical lineup of butternut, buttercup, delicata and acorn, but is worth seeking out. It is the color of a pumpkin but it has a teardrop shape and no ridges. Red kuri is a variety of the hubbard squash (cucurbita maxima) family. What makes it distinct is the chestnut-y flavor of its flesh. Also, the skin isn’t as thick as many squash varieties, so you can get away with NOT peeling it, a plus in my book. I went to the large farm stand here in Lexington. They grow lots of vegetables, but the varieties tend to be more pedestrian. I saw some squash that looked right, but it was labeled ambercup, so I asked about red kuri. An entertaining conversation ensued. The farm stand guy said that the squash I was looking at was a red kuri variety. He also said that they were the only farm in the area that grew it (which I knew was wrong because I’d just been somewhere that was out of it). I pointed out the ambercup sign to make sure we were talking about the same squash. He then said the sign was wrong (and proceeded to take it down as we talked). He said the variety on display was called golden nugget. I wasn’t confident in his information, so I asked if the skin was edible and if the squash tasted nutty. He said no. However, a woman standing next to the same squash said she had bought some the week before and really enjoyed it because it had a chestnut-y flavor and the skin was so tender after cooking that she could eat it. That made me sure I was buying the right squash. I’ll also mention that when the cashier rang me up, she entered it as ambercup, so I think the sign was right all along. When I returned home, I googled red kuri, ambercup, and gold nugget and gold nugget is a completely different squash. I admire his insistent enthusiasm, but he does need to get up to speed on the varieties they sell. This soup is so easy to make. All the ingredients go into the pot, no preliminary sautéing is required. 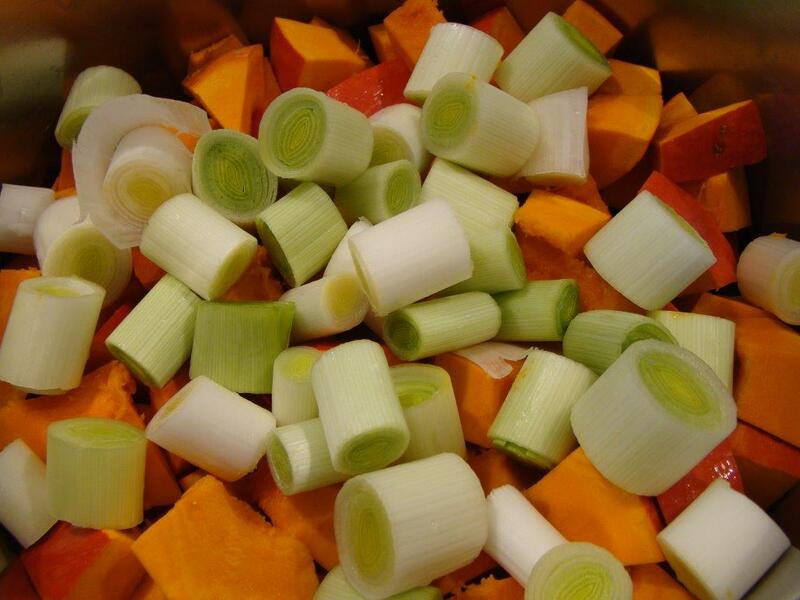 Thick slices of leeks, chunks of unpeeled squash, and liquid. I used half the liquid knowing that I like my soups thicker than Dorie does. I am also not wild about milk in soup, so I used all water. The soup simmers for about half an hour, until the squash is tender, and then it gets pureed in the blender. That’s it! The squash was filled with big seeds reminiscent of a Halloween pumpkin’s seeds. While the soup pot simmered, I cleaned up the seeds, tossed them with olive oil and Old Bay seasoning (I am a Maryland girl, after all! ), and roasted them in the oven for 20 minutes. 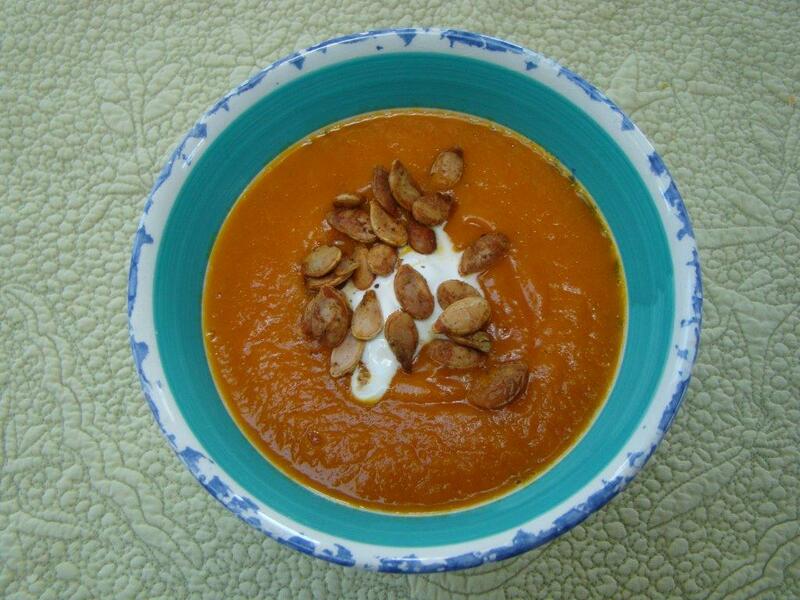 The seasoned squash seeds made a perfect garnish for the soup along with a dollop of crème fraîche. The recipe can be found on page 78 of Dorie Greenspan’s book Around My French Table. To see how the other Doristas made out, check out their links here.